After reading Clockwork Princess I basically went into mourning over the end of the series. I have been unable to shake the characters and I was reminded how much I absolutely ADORE one in particular. 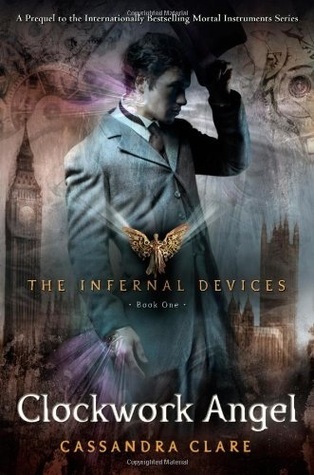 So this week I decided to spotlight the one and only Will Herondale from The Infernal Devices by Cassandra Clare. “My name is Herondale,” the boy said cheerfully. “William Herondale, but everyone calls me Will. Is this your room? Not very nice is it?” He wandered toward the window, pausing to examine the stacks of books on her bedside table and then the bed itself. He waved a hand at the ropes. “Do you often sleep tied to the bed?” --- And that my friends is how we are introduced to Will Herondale. How could I not fall in love with him right then and there? He walked into that room to find Tessa and at the same time he walked right into my heart! Will has such a way with words and he ALWAYS has an answer to everything. There is probably one time throughout the whole series where Will is at a loss for words and that was a truly stunning moment. Will is incredibly witty but in a very silly way. He always has an answer, but sometimes that answer is so ridiculous you just cannot help but burst out laughing at what he has to say. I could quote Will until I am blue in the face and I do… I have taken to calling them Willisms. The other thing I absolutely love about Will is his love of books. How he can get lost in a book easily and that books are his saving grace. He understands what it is like to get lost in another world. This simple fact makes him very lovable for any bookworm. However, Will gets lost in his books because he cuts himself off from the real world. He puts up a front and makes the world think one thing, when really he is a wonderful person that deserves so much better than he has. The only person Will ever lets in is Jem and because of that Jem and Will have an extraordinary friendship. It is the definition of unconditional love. There is nothing Will would not do for Jem and nothing Jem would not do for Will. Everyone goes on and on about Will and Tessa or Jem and Tessa… but I think the most important aspect of these books is the relationship between Will and Jem. It is just beautiful and perfect and heartbreaking. Will Herondale is a character that has wormed (if you get the reference plus a bajillion) his way into my heart and he will not be leaving any time soon. Jace may be my first love, but Will has stolen my heart and run away with it never to be seen again. Until one is very tired. "A demon pox on all your houses!" he announced, and yawned. “A forty-foot worm?" Will muttered to Jem as they moved through the Italian garden, their boots - thanks to a pair of Soundless runes - making no noise on the gravel. "Think of the size of the fish we could catch." Jem's lips twitched. "It's not funny, you know." "You cannot reduce the situation to worm jokes, Will. This is Gabriel and Gideon's father we're discussing." "We're not just discussing him; we're chasing him through an ornamental sculpture garden because he's turned into a worm." "A demonic worm," said Jem, pausing to peer cautiously around a hedgerow. "A great serpent. Would that help your inappropriate humor?" I LOVE that you do these character spotlights! Such a neat idea! And oh Will. This boy all kinds of broke my heart. I'm glad Clare did what she did with him and Tessa in CP2. I won't say anything more because I'm sure people who haven't read this might look at my comment! And I agree- his relationship with Jem is simply beautiful. There are no words I can even say to convey just how amazing these two were together! Thanks! It's the perfect outlet for me to ramble on and on about my favorites. And I'm glad you liked the ending to CP2. I have seen some people complaining, but I thought it was perfect. Well said, my dear. I love Will. I like what you said about the importance of his and Jem's relationship too. It truly is the most beautiful part of this series. Glad someone else sees the important of Will and Jem! I just finished reading Clockwork Prince last night. It's a hard choice between Will and Jem, they are both awesome in their own ways. I aslo read your review on Clockwork Princess and I have to admit, I'm a little afraid to read it for fear of the end. No don't be afraid! It's perfect. It hurts and is very emotional but in a good way, I promise! I must start this series!! I must!! This Will character sounds pretty darn amazing, Teresa! I hate I'm so behind with Clare's books :( I'll catch up!! Hopefully! I also just adore the quotes! I think that is my fav about your character spotlights :D Plus, you rock! I love the quotes too! But I did go a bit bananas with this one lol. You rock! See that was my secret plan... to keep you stuck in CP2 feels forever with me! Glad it worked! Have you ever considered that Will reincarnated as Jace? They are SO alike in some ways and Jem always did keep mentioning reincarnation.